Arguably one of the most productive wild trout fisheries in the country. The Beaverhead touts some very impressive stats: 3800+ wild rainbows and browns per mile averaging 16 to 18 inches, and amazingly – a fish of four pounds, or better, for every 20 feet of bank. This means you are never more than a cast away from that trophy trout! The Beaverhead River’s consistent, clear flows and reliable hatches of mayflies, caddis, and yellow sally stoneflies have made it a trout factory and world class fly fishing destination. In terms of the numbers of trout and trout food per square yard, the Beaverhead is off the charts. The ‘Beav’ as the locals call it, does not give up its secrets easily though. 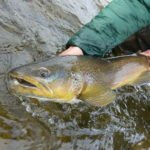 In fact it’s one of the few rivers anywhere where a guide is really a necessity for a successful day’s fishing, especially if you’re new to this river. Tight quarters, strong currents and hard fighting wild trout require short accurate casts and disciplined line management. But, for those eager and focused, the rewards can be remarkable. The Beaverhead is surprisingly small compared to some of our other Southwest Montana rivers, and is characterized by fast riffled corner and pool configuration with lots of overhanging willows. We typically drift fish from the boat, stopping along the way to fish the corners and buckets. This is where your expert FishTales guide will teach you the importance of fishing short, accurate casts and good line management and mending. Meandering through hay fields and cow pastures, its endless oxbows and grassy cut banks provide perfect habitat for true trophy size wild brown trout. The crew at FishTales knows what it takes to deliver a memorable experience on the Beaverhead. Plan your Montana flying fishing adventure now! Sizes will vary from #14-22 depending on specific hatch’s and water conditions.